Have you felt a little stiffness in your lower back or maybe felt pain in your neck or wrist whilst you’ve been at work recently? If so, then you’re certainly not alone. According to the Health and Safety Executive 11.6 million working days are lost per year to work related musculoskeletal disorders. If you work in an office, then it’s odds-on that you use a computer for the majority of your working day. 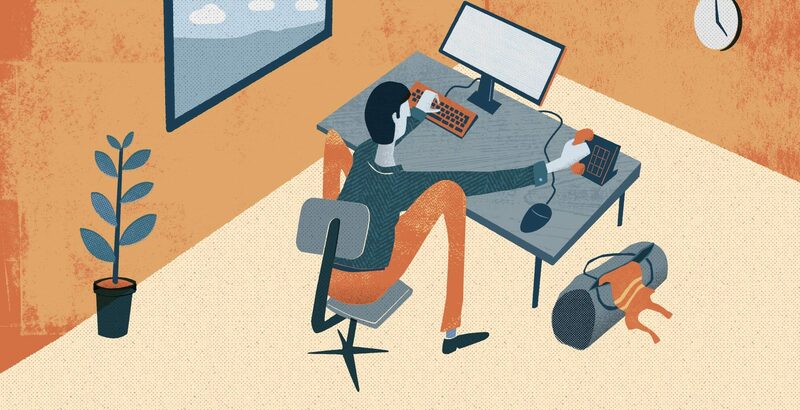 It isn’t inevitable that you’ll develop some form of musculoskeletal pain through using a computer, but the sedentary and desk-centred nature of office work can be a contributing factor to developing overuse or repetitive strain injuries (‘RSI’s’). It’s also likely to exacerbate pre-existing conditions, such as carpal tunnel syndrome. Unless you’re planning to win the lottery to absolve the need for work, then requesting a Workstation or ‘Display Screen Equipment’ assessment would be a good place to start. Your employer has a responsibility to carry out these checks under the Health and Safety (Display Screen Equipment) Regulations (1992) – yes, you can quote me on that. This goes some way to ensuring that you are positioned comfortably to do your work. It commonly involves making adjustments to the height of your chair, monitor(s), and the way that you have organised your desk. If you’ve had a DSE assessment in the past it may be useful to request a new one if you’ve moved desks, or your working practices/job role has recently changed or if you are experiencing aches and pains whilst working. You probably sit at your desk for longer than you lie in bed, so it’s important that you and your desk set-up fit well. If pain at work is becoming an issue, make sure your see your GP or a physiotherapist for advice and don’t let your problem become chronic. You may also find that you benefit from a more comprehensive ergonomic assessment, often provided by physiotherapists or occupational therapists who will come and visit you in your workplace. To minimise the strain on your arms and shoulders, the things you use most should be placed in your “primary reach zone”. This is the area on your desk that you can easily and comfortably reach without having to lean forwards in your chair. For example, you would put your keyboard, mouse and telephone all in your primary reach zone. Maybe give the miniature zen sand garden a miss. As children we were told to sit up straight and sit still. Let’s break that rule. Having the right furniture and equipment is very important, but if the fit isn’t right, even a £10K designer chair isn’t going to help. It’s important to remember that even with the best office chair, prolonged static postures create strain on joints, muscles and tendons that can lead to or exacerbate pain. Try to make a conscious effort to change your posture every 20 minutes or so. This doesn’t mean that you have to break out into a full blown Ashtanga Yoga routine in the middle of the office. Simply pushing your chair back from you desk, reaching your arms above your head and gently rotating your trunk from side to side for 30 seconds is a great way to introduce a little movement into your day. It is probably no surprise that if we are physically active and fitter outside the office it helps manage both the physical and psychological stress that we all experience from time to time inside the office. Getting out for short lunchtime run or class at the gym can be a great way to clear your head and keep in shape. Studies have demonstrated the benefits of regular exercise in reducing the incidence of ‘work related upper limb work related disorders’ (catchily abbreviated to WRULD’s), as well as improving workplace productivity. Most importantly, try to find an exercise that you enjoy doing and prioritise sometime for it, ideally two or three times per week. If running appeals to you, why not get your office team to join the twice-weekly lunchtime running groups from The Running Works. The supervised runs are completely free and there are lockers and a shower available in the store. You can return to work invigorated and refreshed! If you are suffering from aches and pains that are making your work day uncomfortable, why not book an appointment with the physio team at the Run-Fast Sports Clinic based at The Running Works?